I changed my plans quite a bit and decided to tackle a few short adventures in the broadest sense. I chose some which have no achievements on Steam to be able to flag them as “completed” once I’ve played through them. 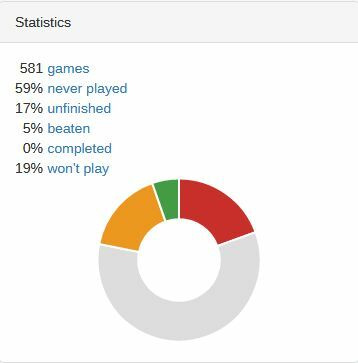 What annoys me most about those statistics is the high amount of games that I’m fairly certain I won’t play. However, if I consider why I own these games but don’t want to play them I feel a bit better. Out of those 113 games about 40 are from the Dollar Mega Bundle that I mostly bought in the hopes of making a tiny win by selling the cards. Then there are plenty of games that I got from bundles before I knew of Steamgifts and which I thus activated just because. A handful of games I own on different platforms (e.g. Dragon Age or Dead Space). Lastly, there are a few games which I tried but just did not like at all. I’ll try to concentrate on the big mass of games that I’m still interested in instead of being annoyed by the ones I probably won’t play. Who knows, maybe I’ll one day give those games a second chance once I’m done with the other games…? After having bought a xbox controller for the sake of playing certain games with it I’ll probably give Darksiders a shot. I’ll also continue to play Dungeon of the Endless some more (mostly because I genuinely enjoy it and it’s great for in between because you can always easily pause and save it and it loads extremely fast). I’ll also try to collect the achievements I’m missing in 9 Clues: The Secret of Serpent Creek. I decided to edit this post rather than create a new one to minimise spam a bit. I have decided not to hunt missing achievements but tackle games that I have not played at all. I’ll probably also postpone Darksiders because it would take more time than I am willing to commit to a single game at the moment. I’ve finally decided to tackle my massive backlog and began by finding out which games I’ve actually beaten (the fact that I had to check the achievements in some cases to make sure that I actually did beat them was somewhat discomforting). I still have to sort a lot of games, especially into the “won’t play” category, as many are remnants of a pre-Steamgifts era and thus do not interest me (or were bought for the cards, as was the case with the dollar bundle a few weeks ago). However, I already finished my first game since registration regardless (Brothers: A Tale of Two Sons) and was even able to complete it in the sense of getting all the achievements.